Where plants are pot grown, we always show the size of the pot (measured in litres). We do this to help you visualise the bushiness of the plant which directly relates to the size of the pot. 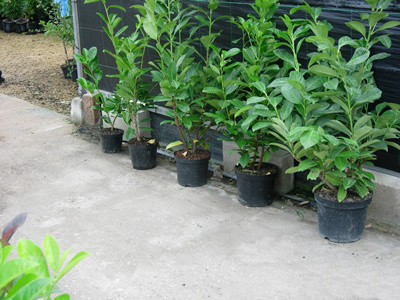 We also sell cell grown plants which have been grown in mini pots (or cells) - these are small plants which have smaller roots than plants grown in 2 litre pots, but they are very inexpensive. For some species, we also sell P9s which are 9cm pots (a bit bigger than a yogurt pot). Across is a photograph of one of our biggest selling species, in various pot sizes. From left to right the plants are in 2L, 3L, 4L, 5L and 10L pots. All plant dimensions are measured from the top of the pot or root ball ie 40/60cm plants will be between 40cm and 60cm above ground when planted. Pot grown plants are more expensive than cell grown, P9s, bare roots or root balls (for the equivalent height) but it's worth bearing in mind that even the smaller 2 litre pots are a minimum of 2 years old (sometimes 4 years old, depending on growth rate), and they have been re-potted up to 3 times, trimmed up to 5 times, fed regularly and watered daily - and all for less than a glossy magazine or a fancy coffee!